The Lees have a 400 acre farm in Larue country just outside of Hodgenville. More than fifty of those acres are dedicated to growing vegetables like butternut squash, broccoli, corn, and other vegetables. 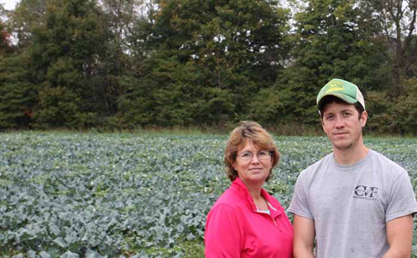 Scotty and Robin Lee opened their greenhouse and garden center on their family farm in 1985. The Lees love food and feeding people, so they always carried vegetables, but in 2010 they increased their vegetable production and began growing for schools and hospitals with the help of their son Jud. In 2018 alone, they delivered 75000 pounds of sweet corn to Jefferson County Public Schools. Robin’s favorite part about their produce business is preparing the vegetables to be eaten by people who will love eating it. In some cases the Lees peel, chop, husk, dice, and puree in their commercial kitchen right on the farm. Robin says, "When I prepare vegetables they’re going to be the best product there is. It’s going to be what I want to feed my kids and grand kids, prepared with love."